(From L – R) Bob Shepherd DAF, Alice Bambling DAF, Dr Ian Braithwaite and Linda Anderson NQ Dry Tropics. 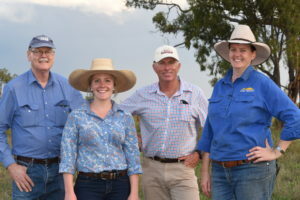 NQ Dry Tropics and the Department of Agriculture and Fisheries (DAF) recently teamed up on a joint initiative to provide Burdekin graziers with access to expert advice on Grazing Best Management Practice from well-known Australian cattle veterinarian, Dr Ian Braithwaite and DAFs principal extension officer, Bob Shepherd. Sixty graziers attended the events, which took place at Charters Towers and Belyando Crossing last month. Dr Braithwaite said that an effective way for graziers to improve the performance of female cattle was to manage the calving period for northern breeder herds by transitioning from a continuous to a controlled mating system. Another effective option was to undertake foetal aging during pregnancy testing and retain those cows that will calve during the November to December period. This allows producers to gradually sell the ‘out of season’ breeders to enhance cash flow for the business. Bob Shepherd spoke about the importance of forage budgeting. This allows producers to adjust breeder numbers at the first round muster to ensure that the balance of the breeders calve in forward body condition score, thus increasing conception rates during lactation in the following summer. Bob also emphasised the role that high ground cover levels have on water infiltration and run-off. Producers attending the events said that the two presentations dove-tailed with each other very well.